The lives of Butch Cassidy (Robert Leroy Parker) and the Sundance Kid (Harry Longbaugh) have become legend. 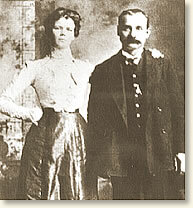 As early as 1903, their exploits inspired the first modern film - The Great Train Robbery by Edwin Porter. Almost seventy years later their artistic inspiration continued with the production of the film Butch Cassidy and the Sundance Kid starring Paul Newman and Robert Redford. The endurance of the legend is perhaps due to nostalgia for the rough and tumble frontier of the Old West. These two outlaws symbolize the vanquishing of a romantic era in American history by twentieth century industrialization and urbanization. Butch Cassidy and the Sundance Kid no doubt had a much different view of their lives. They were, after all, bank and train robbers constantly looking over their shoulders in hopes of escaping capture by the law or death by a rival. Butch Cassidy came to a remote and wild area of Wyoming known as "The Hole in the Wall" in 1896. He surrounded himself with as many as 200 other outlaws and began a career of robbing banks and trains. 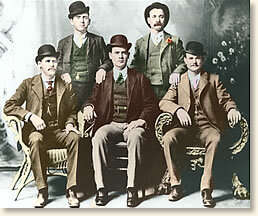 The gang became known by the name of the place they called home or by the term "The Wild Bunch." The Sundance Kid joined the gang a few years later. "As soon as we came to a standstill, Conductor Storey went forward to see what was the matter and saw several men with guns, one of whom shouted that they were going to blow up the train with dynamite. The conductor understood the situation at once and, before meeting the bandits turned and started back to warn the second section. The robbers mounted the engine and at the point of their guns forced the engineer and fireman to dismount, after beating the engineer over the head with their guns, claiming that he didn't move fast enough, and marched them back over to our car. In a few moments we heard voices outside our car calling for Sherman and looking out saw Engineer Jones and his fireman accompanied by three masked men with guns. They evidently thought Clerk Sherman was aboard and were calling him to come out with the crew. Burt Bruce, clerk in charge, refused to open the door, and ordered all lights extinguished. There was much loud talk and threats to blow up the car were made, but the doors were kept shut. In about 15 minutes two shots were fired into the car, one of the balls passing through the water tank and on through the stanchions. Following close behind the shooting came a terrific explosion, and one of the doors was completely wrecked and most of the car windows broken. The bandits then threatened to blow up the whole car if we didn't get out, so Bruce gave the word and we jumped down, and were immediately lined up and searched for weapons. They said it would not do us no good to make trouble, that they didn't want the mail - that they wanted what was in the express car and was going to have it, and that they had powder enough to blow the whole train off the track. After searching us they started us back and we saw up the track the headlight of the second section. They asked what was on the train, and somebody said there were two cars of soldiers on the train. This scared them and they hastened back to the engine, driving us ahead. They forced us on the engine, and as Dietrick moved too slowly they assisted him with a few kicks. While on the engine, Dietrick, in the act of closing the furnace door, brushed a mask off one of the men, endeavoring to catch a glimpse of his face. The man quickly grasped his mask and threatened to "plug" Dietrack. They then ran the train ahead across a gully and stopped. There were two extra cars on the train. They were uncoupled. Others of the gang went to the bridge, attempting to destroy it with their giant powder, or dynamite, which they placed on the timbers. After the explosion at the bridge they boarded the engine with the baggage, express, and mail cars, went for about two miles, leaving the extra cars. Upon arriving at the stopping place they proceeded to business again and went to the express car and ordered the messenger, E. C. Woodcock, to open. He refused, and the outlaws proceeded to batter down the doors and blew a big hole in the side of the car. The explosion was so terrific that the messenger was stunned and had to be taken from the car. They then proceeded to the other mail car, occupied by Clerks O'Brian and Skidmore and threatened to blow it up, but the boys were advised to come out which they did. The robbers then went after the safes in the express car with dynamite and soon succeeded in getting into them, but not before the car was torn to pieces by the force of the charges. They took everything from the safes and what they didn't carry away they destroyed. After finishing their work they started out in a northerly direction on foot. The men all wore masks reaching below their necks and of the three I observed, one looked to be six foot tall, the others being about ordinary sized men. The leader appeared to be about 50 years old and spoke with a squeaky voice, pitched very high." Colbert David, Eyewitness to the American West (1998); Pointer, Larry, In Search of Butch Cassidy (1977). "Butch Cassidy and the Sundance Kid Rob a Train, 1899," EyeWitness to History, www.eyewitnesstohistory.com (1999).